Aberdeen's Lewis Ferguson and Rangers' Allan McGregor. 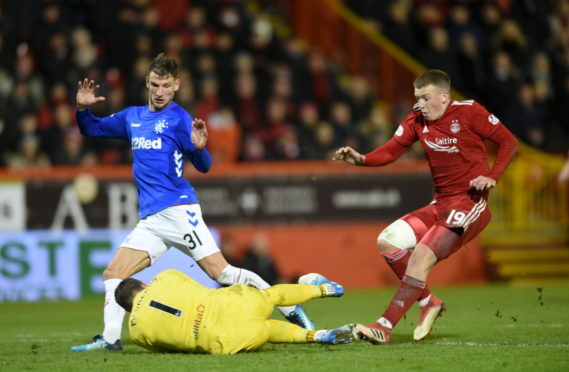 Rangers goalkeeper Allan McGregor is facing a two-game ban following a Scottish FA review into his challenge on Dons midfielder Lewis Ferguson. Aberdeen manager Derek McInnes felt the Dons should have been awarded a penalty in the 4-2 defeat by Rangers at Pittodrie on Wednesday for the Scotland goalkeeper’s challenge on Ferguson during a feisty encounter, which saw both team end the match with 10 men after Alfredo Morelos and Scott McKenna were sent off. The footage of the challenge has been reviewed by the Scottish FA compliance officer with McGregor offered a two game ban. But Rangers have decided to challenge the decision, which will go to a hearing on Tuesday, meaning McGregor will be free to line up against Kilmarnock in the Scottish Cup tomorrow. Rangers have already appealed the red card shown to Morelos with the decision expected later this evening.